Internationally renowned for his portrait caricatures and life-sized bronze animals, Joe Fafard has received numerous awards, including Officer of the Order of Canada (1981). His work was honoured on a series of postage stamps issued by Canada Post in 2012. 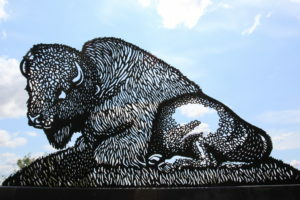 The title can be traced back to the Cree word for bison. Energy Check! Walking Edmonton’s Riverfront trails will add approximately 20 minutes to your walk. Not enough time? Take the Centre’s escalators up! After 7PM walkers must take the stairs or sidewalk up to return to Jasper Ave. Hours: M – SU 7AM – 7PM.